Ethnicity: Nigeria has more than 250 ethnic groups, with Hausa-Fulani, Yoruba and Igbo accounting for 70% of the population. Religion: Religious affiliation is split among Islam (45%), Christianity (53%), and indigenous beliefs (2%). Islam is dominant in the north, whereas Christians are the majority in the south. Languages: English is the official language and the language of instruction after Grade Three. Hausa, Yoruba and Igbo are designated as national languages. Founding Date: Nigeria became a British colony in the 19th century and gained independence on October 1, 1960. Administration: After many years of military rule, the country emerged as a multi-party democracy in 1999. It is divided into the Federal Capital Territory (Abuja) and 36 states. Since 1982, Nigeria has adopted a 12-year system of school education, consisting of 6 years of primary school, 3 years of junior secondary school and 3 years of senior secondary school.After completion of senior secondary school, students take external examinations conducted by the West African Examinations Council (WAEC) or National Examinations Council (NECO) to receive the Senior School Certificate, which gives them access to university study. Higher education in Nigeria follows the three-tier degree structure – bachelor’s, master’s and doctoral-level studies. In addition, certificate and diploma programs are offered at both the undergraduate and graduate levels. General bachelor’s degrees involve 4 years of full-time study. Bachelor’s degrees in specialized and professional fields such as agriculture, architecture, education, engineering and technology, law, medicine and dentistry, nursing and pharmacy take 4 to 6 years to complete. Master’s degrees involve 1 or 2 years of full-time study beyond the bachelor’s degree. The Master of Philosophy (MPhil) is a pre-doctoral program that takes 1 to 2 years after completion of a master’s degree. Doctoral degrees (PhD) are earned at least 2 years after the master’s degree. Some established universities require an MPhil for admission into their PhD programs or offer combined MPhil / PhD programs. Senior secondary graduates may also pursue technical education by taking a 2-year program leading to the National Diploma (ND). ND holders, after obtaining at least 1 year of industrial experience, may complete a 2-year program to receive the Higher National Diploma (HND). Universities may grant advanced standing to ND and HND holders who apply to their undergraduate programs. Nigeria has 104 universities (63 public and 41 private). Public universities can be established either by federal or state governments. The National Universities Commission (NUC) advises the federal and state governments on the creation of new public universities and processes applications for the establishment of private universities. See the NUC website for a list of recognized universities in the country. The National Board for Technical Education approves and accredits technical institutions, including polytechnics that offer National Diploma and Higher National Diploma programs. Senior School Certificate Completion of Primary and Junior Secondary School (9 years) 3 years Generally compares to the completion of a High School Diploma. National Diploma Senior School Certificate 2 years Generally compares to the completion of a post-secondary Diploma. Higher National Diploma National Diploma and at least 1 year of work experience 2 years Generally compares to the completion of a 3-year post-secondary Diploma. Bachelor’s Degree (Honours) Senior School Certificate 4 to 5 years Generally compares to the completion of a 4-year Bachelor’s degree. Nigeria Certificate in Education Senior School Certificate 3 years Generally compares to the completion of a post-secondary Diploma. Bachelor of Education Senior School Certificate 4 years Generally compares to the completion of a 4-year Bachelor of Education degree. Bachelor of Law(s) (LLB) Senior School Certificate 5 years Generally compares to the completion of a first professional university degree in law. Bachelor of Medicine and Bachelor of Surgery (MBBS) Senior School Certificate 6 years Generally compares to the completion of a first professional university degree in medicine. Bachelor of Dental Surgery (BDS) Senior School Certificate 6 years Generally compares to the completion of a first professional university degree in dentistry. Doctor of Veterinary Medicine (DVM) Senior School Certificate 6 years Generally compares to the completion of a first professional university degree in veterinary medicine. Postgraduate Diploma Bachelor’s Degree or Higher National Diploma 1 year Generally compares to the completion of a graduate Certificate. Master’s Degree Bachelor’s Degree or Higher National Diploma plus Postgraduate Diploma 1 to 2 years Generally compares to the completion of a Master’s degree. Master of Philosophy Bachelor’s Degree or Master’s Degree 1 to 2 years Generally compares to the completion of a Master’s degree. Doctor of Philosophy Master’s Degree or Master of Philosophy 3 years (minimum) Generally compares to the completion of a Doctor of Philosophy (PhD) degree. 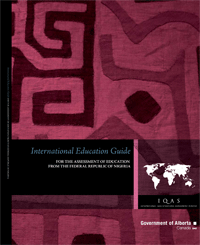 These templates give detailed information on educational credentials awarded for programs of study completed in the Federal Republic of Nigeria.